Winter offers time to sit down with a good book. Here is a new title that I just finished. “Writing the Garden: A Literary Conversation across Two Centuries” (David Godine Publisher), a collection of garden writing from the eighteenth century to today, offers an opportunity to meet garden writers who have inspired gardeners for decades. 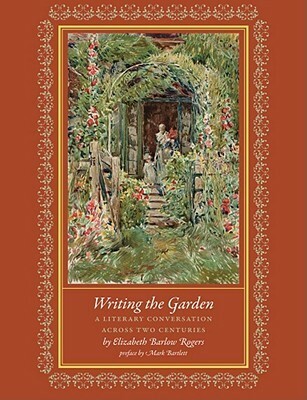 In reading the book I felt like the author Elizabeth Barlow Rogers had organized a retreat where garden writers have assembled to inspire the audience of gardeners. Rogers has written several books on garden history. First person to hold the title of Central Park Administrator, she became founding president of the Central Park Conservancy. The book’s garden writers share their passion for gardening, for nature, for life. The divisions of the book highlight a category Rogers considers important for a particular garden writing genre. Thus, we read passages about the garden by nurserymen, travelers, spouses, teachers, and even humorists in the garden. Nursery owner Gene Bush from Depauw, Indiana writes that although he is essentially a plant collector, he tries not to let the overall design appear as a series of collections in the garden. That seemed good advice for me, to be sure. I loved that several of the forty-two writers she mentions fight the gardener’s war with slugs. Rogers includes poet Celia Thaxter, artist Robert Dash, and even Michael Pollan who calls the slugs “naked bullets of flesh who hide from the light of day, emerging at sunset to cruise the garden along their own avenues of slime.” Don’t the words alone make you want to distance yourself from the little slug? That’s probably why reading the book seems like meeting old friends who just happen to be gardeners.